This post was originally published on Knoll Inspiration in 2015. 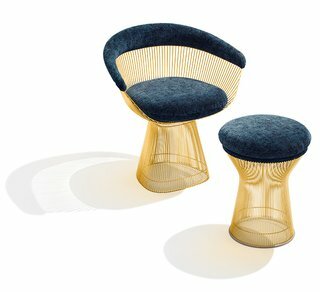 In celebration of the 50th anniversary of the Platner Collection, Knoll returns to Warren Platner's original design, introducing an 18k gold-plated finish option to the original 1966 collection. The finish, plated in Italy, is available for the Platner Lounge Chair, Platner Arm Chair, Platner Stool, Platner Dining Table, Platner Coffee Table and Platner Side Table. The launch also extends the Platner Collection's bronze finish—previously available through Knoll’s retailers and showrooms—to the company’s online offerings. Platner Arm Chair and Stool in 18k gold-plated steel. Photograph by Ilan Rubin. 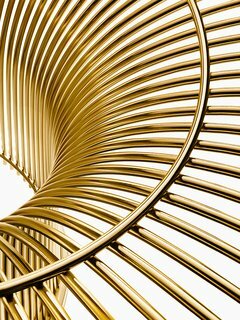 The Platner Collection was designed in 1966 by architect Warren Platner, who intended it to be gold-plated. However, the technology of the time made gold plating in large-scale production impossible, leading to the nickel-plated steel known today. The 2015 issue of Platner Gold fulfills Platner's original wish. 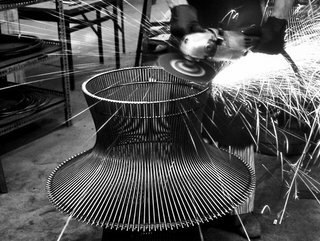 Production process behind the Platner Coffee Table. Photograph from the Knoll Archives. The gold finish reflects Platner's gilded modern aesthetic, the most quintessential example of which is his design for Windows on the World, a complex of venues that crowned the North Tower of the former World Trade Center. Lush with brass fixtures, taupe upholstery, shiny wood-paneling and kaleidoscopic mirrors, the sky-high interior was named a "modernist Versailles" by some architectural critics and featured two restaurants, a bar—called "The World's Greatest Bar"—and a number of luxurious executive lounges. 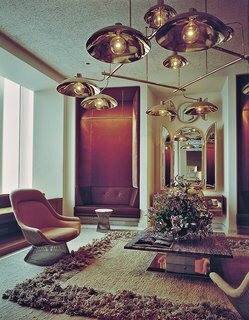 The Windows on the World reception room, designed by Warren Platner in 1976, included a Platner Easy Chair and Platner Side Table. Photograph courtesy of the Nestlé Library. The pieces in the Platner Collection are each made up of hundreds of individual welds, all soldered by hand, resulting in forms that recall "sheafs of wheat." Platner favored more expressive and shapely designs than those generally called for by other brands of modernism. "I, as a designer, felt there was room for the kind of decorative, gentle, graceful kind of design that appeared in a period style, like Louis XV." The Platner Arm Chair's seamless hourglass silhouette is demonstrative of this particular approach. Explaining the thought process behind the design, Platner asked, rhetorically, "Why separate support from the object? Just make it all one thing." When Benjamin Pardo, Knoll Design Director, visited Platner to renew the architect’s 1966 collaboration with the company, he learned that Platner originally intended the collection to be gold-plated. Simultaneously working to reintroduce the designer's Easy Chair and Ottoman, Pardo came away from a meeting with an original Platner Ottoman and began attempting to recreate the design with its intended finish. "I went to the Italians and asked if they could do it and they said, ‘no.’ I kept asking them, again and again, and they were eventually able to create a series of prototypes." 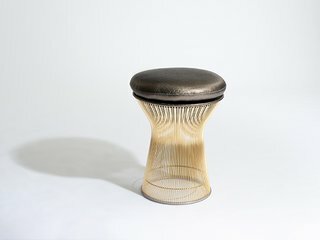 Platner Stool in 18k gold-plated steel. Photograph by Knoll. However, the finish still wasn’t quite right. It wasn't until 2008, while working on the copper-plated legs for the Architecture & Associés Collection, that Pardo was able to achieve the proper, durable coating he desired. Although such finishes have been around for years, they’ve been restricted to decorative and technical applications, since the coating is subject to wear. Only recently has modern technology enabled designers to attain durability through the process. 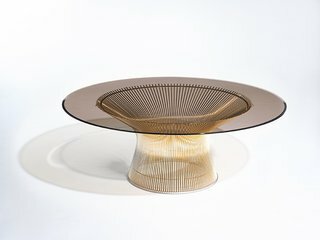 Platner Coffee Table in 18k gold-plated steel. Photograph by Knoll. Apart from the connections to the designer's own practice, Pardo sees the new finish as a reflection of Scandinavian design principles. "In that tradition, glossy metal tones—copper, gold, brass and bronze—are always used in connection with light and reflectivity," Pardo explains. The application of such a material to Platner's storied designs affords them a new element of versatility. "They’re both there and not there, depending on how you look at them," offers Pardo, "they can appear more invisible or more present, depending on the lighting and the environment." Discover Bertoia Gold, introduced by Knoll in celebration of the Harry Bertoia Centennial.